The telecom and cable kings of the broadband industry have failed to bridge the digital divide and opted to serve the most lucrative markets at the expense of universal, affordable access. As a result, local governments and community groups across the country have started building their own broadband networks, sometimes in a purely public service and more often through public-private partnerships. The incumbents have responded with an aggressive lobbying and misinformation campaign. Advocates of cable and DSL providers have been activated in several state capitols to push new laws prohibiting or severely restricting municipalities from serving their communities. 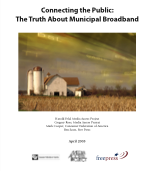 Earlier this year, Verizon circulated a “fact sheet” to lawmakers, journalists and opinion leaders proclaiming the so-called “failures” of public broadband. Many of the statistics come from a widely discredited study of municipal cable TV networks published in 1998. 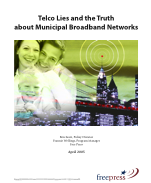 This paper debunks these lies case by case, juxtaposing information direct from the city networks with quotations from the telco propaganda. The results are unequivocal and damning. Discussion about Bristol Virginia Utilities and Chelan Public Utility District in Washington. Bristol Virginia Utilities (BVU), a not-for-profit electric municipal utility, began offering voice and data services to local schools and government operating in the Bristol, Va., area in 2001. Using a fiber optic network, the company affordably provided the community with access to the most advanced communications technology available. As a result, BVU satisfied a primary objective of enabling economic prosperity and new business development from the improved communications infrastructure. In this paper, we explore whether broadband investment by municipalities has an effect on economic growth. To do so, we employ an econometric model to compare economic growth in Lake County, Florida, with other similar Florida counties. 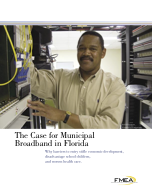 From fiber optic communications between medical offices and hospitals in and around Leesburg, to advanced services for schools, students and a business park in Quincy, to a wireless “Downtown Canopy” in Tallahassee, cities and towns throughout the State of Florida are taking charge of their futures by investing in new, exciting and innovative broadband technologies that attract businesses, educate the young, and improve the quality of life. Full Title: Paying the Bills, Measuring the Savings: Assessing the Financial Viability and Community Benefits of Municipally Owned Cable Television Enterprises. This paper provides evidence that municipally owned and operated cable television enterprises are financially viable and provide large rate savings to their communities. The findings contradict allegations in Costs, Benefits, and Long-Term Sustainability of Municipal Cable Television Overbuilds, a 1998 paper authored by Ronald J. Rizzuto and Michael O. Wirth, that such enterprises are likely to be poor investments for cities. Empirical Study: Does Municipal Supply of Communications Crowd-Out Private Communications Investment? There are 2,007 municipalities across the United States that provide electricity service to their constituents. Of these, over 600 provide some sort of communications services to the community. An important policy question is whether or not public investment in communications crowds out private investment, or whether such investment encourages additional entry by creating wholesale markets and economic growth. We test these two hypotheses – the crowding out and stimulation hypothesis – using a recent dataset for the state of Florida. Doris Kelley takes a look at one of the early citywide publicly owned broadband systems - Cybernet in Cedar Falls, Iowa. Cybernet is run by Cedar Falls Utilities (CFU) and is an HFC (cable) network that also offers some fiber-optic connections for businesses. In this paper, Kelley takes a look at some of the benefits the network has brought to the community. In this short two-page summary of Kutztown's progress, Frank Caruso briefly explains the benefits of the network and the reason behind their investment. We are engaged in a rare event - we are moving offices. The Institute for Local Self-Reliance pre-dates our initiative and has been in this location for over 20 years. During the packing and sorting, we have encountered a curious collection of treasures.